ESCAPE … to Daintree Valley Haven, a lovely 30-acre rainforest B&B hideaway retreat in the beautiful Stewart Creek Valley. 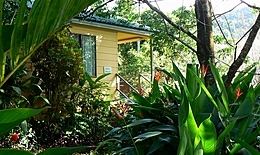 Peaceful self-catering Daintree accommodation near historic Daintree Village and the World Heritage-listed Daintree National Park. UNWIND … in one of three private self-contained bungalows, perfect for couples, nature-lovers, birders, honeymooners or simply to slow down surrounded by rainforest and tropical gardens. Dozens of exotic tropical fruit trees, birds, butterflies and wildlife. 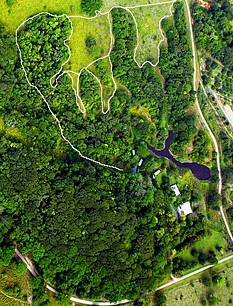 Stroll around easy walking trails, relax in the jacuzzi-spa or simply curl up with a good book. REJUVENATE … breathe pure air ... drink natural water ... marvel at the stars ... listen to the silence - broken only by birdsong! Thank you for an AMAZING stay!! We feel like we've been in an Attenborough documentary! The birding has been sensational along with all the other butterflies, reptiles, frogs, bugs and the plants!! We can't stop using exclamation marks!! Thank you so much Daphne and Peter for your wonderful hospitality and for sharing such an amazing part of the world. We'll be back - thanks again! 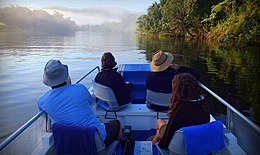 Enjoy rainforest walks, spot crocodiles, birds and wildlife on a Daintree River cruise, go fishing, explore a beautiful beach, cruise to the Great Barrier Reef - or simply stay at home and relax! Established in 2000 by resident owner/managers Peter and Daphne Titus-Rees, Daintree Valley Haven is a unique tropical 30-acre hideaway 8 km (5 miles) beyond Daintree Village at the end of the beautiful Stewart Creek valley, surrounded by the World Heritage Daintree National Park. It offers comfortable, tranquil rainforest B&B accommodation for couples, birders, honeymooners and folks seeking a rest from their busy lives. No mobile or TV reception here! But if you really do need to keep in touch there is free WIFI ... and it's just a short scenic valley drive to the nearest mobile reception. 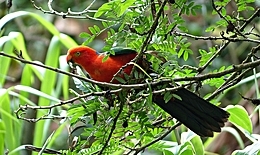 Tropical gardens, native trees, rainforest and exotic tropical fruit trees attract over 140 species of birds and butterflies - Daintree Valley Haven is a paradise for birders and nature-lovers. Easy walking trails follow the rainforest and wander through open grassland, home to wallabies, bandicoots, birds and wildlife. Peace, tranquility and seclusion near Daintree Village. An easy drive to Mossman Gorge, Cape Tribulation, Port Douglas and the nearby Atherton Tablelands (Cairns Highlands). A 90-minute drive from Cairns airport along the stunning Great Barrier Reef Drive, one of Australia's most spectacular coastal roads. The Shed, an historic old building built with timber from the old butter factory once operating in Daintree Village, has a barbeque area, jacuzzi, dartboard and the 'Un-fridge' houses a range of reference books, board-games, a book-exchange and here there is free Wi-Fi access. The self-contained bungalows are each designed for a maximum of three guests, are fully insect-screened and air-conditioned with ensuite, kitchenette and private balcony. Please note the property is not suitable for children under 12. A complimentary breakfast basket is delivered daily to your bungalow and includes home-grown tropical fruits, home-made jams and yoghurt, coffee and Daintree tea. Self-cook meals and drinks are available or bring your own supplies. Daintree Valley Haven offers something for everyone - nature-lovers and birdwatchers - adventure-seekers - divers and snorkellers - photographers - honeymooners - fishing folk - or simply a tranquil escape from a busy lifestyle. Escape ... Unwind ... Explore ... Rejuvenate!